We catch up with the Finns to find out why you should be playing last year's PC hit on the Xbox 360. Kikizo: Briefly, what do you think of other recent racing titles like Forza 2, Colin McRae: Dirt, MotorStorm, etc.? Which do the team look forward to next? And do any of these inspire the direction of FlatOut? Laakkonen: All those games are really great. Forza, Project Gotham Racing and Dirt are all outstanding games and MotorStorm is in my opinion PS3's best launch title. 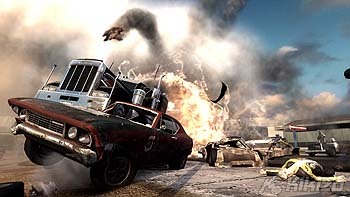 I think the game we are most waiting to see is Burnout Paradise too see what aces Criterion has up its sleeve. Interestingly, I've understood from the Motorstorm development teams' interviews that FlatOut actually inspired them. You have to of course look at what the best developers in the field are working on, but if you want to be successful, you need to forge your own path. That's what we have been doing with FlatOut and with FlatOut Ultimate Carnage it feels that everything has really clicked. Kikizo: Which multiplayer mode do you expect will be most popular? Laakkonen: That's easy. It will be the Deathmatch Derby. It's a cross between a first-person shooter free-for-all and destruction derbies. You start with three lives and the goal is simple: wreck everybody else. Players can pick up power-ups to give them armour, more wrecking power, infinite nitro and more. We've also made the cars more fragile, so it's explosions galore all the time. Once you are dead you re-spawn in a couple of seconds to get straight back in to the action. It's really immediate and really fun! Kikizo: Were there any technical challenges in terms of keeping so much going on at once? What about putting 12 cars on top of this? Laakkonen: Physics is one of our key strengths. Already on PS2 we were delivering more action than anybody else, and our elite ninja coders have been honing their skills ever since. Seriously, it is lot of hard and complex work, which I suppose is why we don't see other games doing it on this scale. Kikizo: What sort of framerate have you been aiming for since the start of the project? How important do you feel it is for fast paced action filled games like this run at 60 fps? Laakkonen: It's not really that important for a game like FlatOut. What matters is consistent 30 fps framerate with no hiccups or slow downs. There's no problem making the game run at 60 fps - if you cut back on the action. And that's not something we wanted to do. Kikizo: What's your opinion on so-called full HD, 1080p graphics? 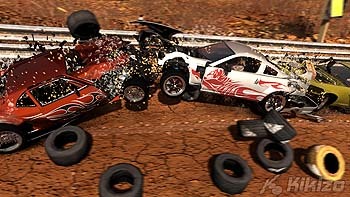 Would it be possible to get FlatOut running at this standard on Xbox 360 or perhaps PS3? Laakkonen: Actually we had FlatOut running at 1080p, and with a couple of weeks more optimizing time it would have run at 1080p also. But at the end, there aren't many people who could enjoy that resolution just yet, so we felt that that optimizing effort was better directed at features that everybody can enjoy. Kikizo: Which aspects do you recommend gamers focus on most when learning how to be the best in FlatOut, in terms of balance between Nitro, best routes, driving skill/racing lines and aggression? Laakkonen: It depends on the type of player. 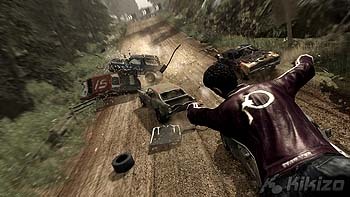 You can't win in FlatOut Ultimate Carnage if you shy away from contact altogether, but the amount of aggression you need depends on what type of game play you prefer. Racing nuts will find plenty of subtlety in the game's handling model and the wealth of performance upgrade options, and for them it is likely to be primarily about racing lines and tuning up their rides. However, if you are more of an action-oriented player, ramming your way to victory, taking daring shortcuts and blasting through buildings and opponents will be your strategy. 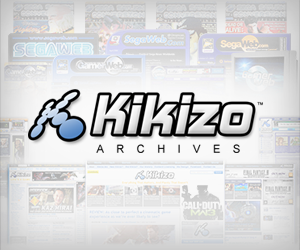 Kikizo: Do you view Sega's Full Auto series as a competitor? Laakkonen: Not really. Car combat with guns and action racing like FlatOut are quite different. Kikizo: When will we see more FlatOut for PS3, PC, or portables? Laakkonen: First up is FlatOut Head-On for PSP, which is being developed by a third-party using our technology and our assistance. It's looking mighty fine.